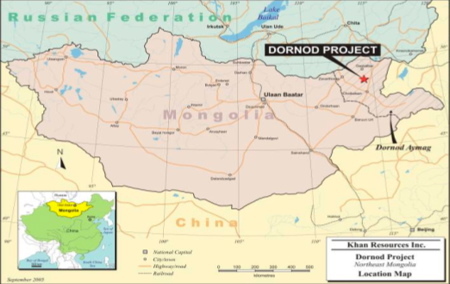 The two sides met last week to reach agreement over the cancellation of Khan’s uranium mining licenses in eastern Mongolia in 2009, which led to an international arbitration court ruling last month that the Toronto-based company is due compensation from the government. According to a statement on the Ministry of Justice’s website, Khan ended negotiations early and the government will now seek to nullify the award. Khan’s chief executive officer, Grant Edey, said in an e-mail that the meeting was short because the two sides “remained apart in their respective positions” and the company is confident the award will be upheld. The dispute has been further clouded by the death of Khan Resources Chairman James Doak. The 59-year-old executive was found dead in his hotel room in Ulaanbaatar on April 23. Doak died of an unspecified disease and the police don’t suspect foul play, local media reported. Khan’s award, which is accruing interest at a rate of $6,485 a day, had neared the $104 million mark at the end of last month. Mongolian Prime Minister Saikhanbileg Chimed has vowed to resolve a series of high profile disputes with overseas companies that have contributed to a slump in investment and economic growth. The Asian Development Bank has forecast a 3 percent expansion this year from 7.8 percent in 2014.